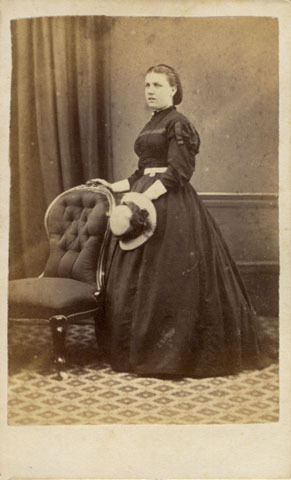 [ABOVE] A carte-de-visite portrait of an unknown woman wearing a hat and cape, photographed by H. Betts of Brighton (c1862) Samuel Henry Betts worked as a photographic artist under the name of "Henry Betts" in Brighton during the early 1860s. Henry Betts was born "Samuel Henry Betts" in East Peckham, Kent, around 1825, the son of Samuel Betts (c1799-1869), a London-born portrait painter. To distinguish himself from his father Samuel Betts senior, the artist Samuel Henry Betts was generally known as Henry Betts during the lifetime of his father, only reverting to his original name of Samuel Henry Betts after his father died in 1869. The 1851 census of lists "H. Betts" as a portrait painter at 58 William Street, Brighton. The 1861 census records (Samuel) Henry Betts as a thirty-three year old "Photographic Artist" at 57 Gardner Street, Brighton. Also residing at 57 Gardner Street was Henry Bett's sixty-one year old father, Samuel Betts, described as a "Retired Portrait Painter", Henry's sister, Fanny Betts, described as a seventeen year old "Actress", and Frederick Hatcher, the two year old grandson of Samuel Betts senior. On 27th November 1865, Samuel Henry Betts married eighteen year old Sarah Ann Hill (born 1847, Brighton) at St Nicholas' Church, Brighton. In 1867, Samuel Henry Betts' wife Sarah gave birth to a baby girl, who was christened Fanny Eliza Harrison Betts at St Nicholas' Church on 16th December 1866. A second child, a boy named Alfred Henry Betts, was born in 1869. ( Alfred Henry Betts was generally referred to as "Henry" by family members). The 1871 census records Samuel H. Betts as a forty-five year old "Miniature Painter" at 74 Upper North Street, Brighton. Living with Samuel Betts was his twenty-four year old wife Sarah Betts and their two children, Fanny, aged 4, and two year old Henry. The 1881 census shows Samuel Henry Betts living with his two children, Fanny and Henry, at 80 Upper North Street, Brighton. Samuel Henry Betts' wife Sarah Ann Betts was staying at the Melbourne Hotel, Beddington when the 1881 census was taken. On the census return, Samuel H. Betts again gives his profession as "Miniature Painter". Samuel Henry Betts was listed as an artist at 80 Upper North Street, Brighton in local trade directories up until 1888. By 1890, Samuel Betts and his family had moved to Hove and were living at 16 Connaught Terrace. The 1891 census shows Samuel Betts, his wife Sarah and grown up son Henry Betts at 16 Connaught Terrace, Hove. On the census return, the enumerator notes that the sixty-five year old artist was afflicted by paralysis. The following year, Samuel Henry Betts died at his home in Hove at the age of sixty-six. [The death of Samuel Henry Betts was registered in the district of Steyning during the 1st Quarter of 1892]. 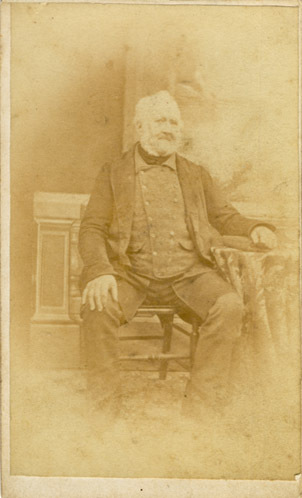 Edwin Walter Betts, a "Photographic Artist of Russell House, Brighton" was entered as the father of Edwin Alfred Betts in a baptism record dated 14th January 1855. The mother of Edwin Alfred Betts (born c1855, Brighton) was registered as Jane Betts. Alfred Betts, an "Artist" from Bristol married Zilpah Carr in Brighton on 2nd October 1856. 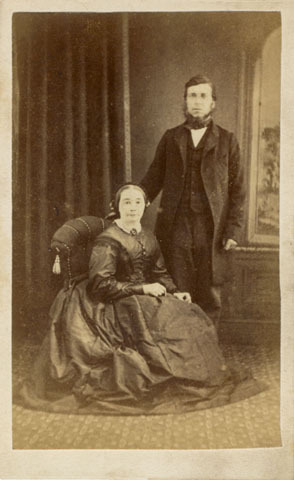 Alfred and Zilpah Betts were the parents of Alfred Betts (baptised in Brighton on 22nd November 1857), who later became a photographer in Derby and Fleetwood, Lancashire. Benjamin William Botham, the son of a tailor, was born in the Suffolk market town of Halesworth in 1824, Around 1860, Benjamin Botham arrived in the Sussex seaside resort of Brighton and in the 1861 census he is recorded as a thirty-six year old "Photographic Artist" at 23 Egremont Place, Brighton. Around 1861, Botham took possession of the photographic portrait studio at 59, North Street, Brighton, which had been established in 1853 by pioneer photographer Robert Farmer (1823-1859). 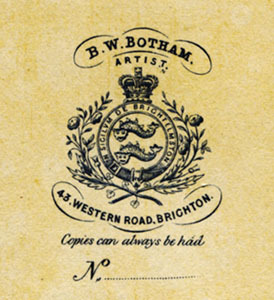 By 1862, Benjamin W. Botham had acquired a photographic portrait studio at 43 Western Road, Brighton. Botham remained in business as photographer at 43 Western Road until the summer of 1868, when he sold his photographic business at 43 Western Road to Charles Nathaniel Wootton of Cambridge. Benjamin Botham abandoned photography and started a new career as the proprietor of The New Oxford Theatre of Varieties in New Road, Brighton. Botham's new venture was a success, but around 1874 he became seriously ill. Benjamin William Botham died at his residence at 6 Marlborough Place, Brighton on 18th December 1877, aged 53. For some years, I believed that Thomas Boxell (1823-1885), a Brighton watchmaker, was the owner of the photographic portrait studio which was located in North Street, Brighton in the late 1860s. During my recent research, I have discovered that there were in fact two men named "Thomas Boxell" living in Brighton at this time - Thomas Boxell the clock and watchmaker of King's Road, Brighton, and Thomas Boxell (1847-1939), a tailor's son who became a professional photographer in Brighton during the 1860s. Thomas Boxell was born in Brighton in 1846, the second eldest son of Matilda Ann Combs and George Boxell, a tailor. 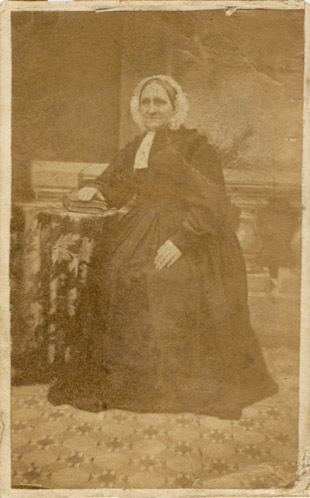 Matilda Ann Combs, Thomas Boxell's mother, was the daughter of Susan and William Combs, a shoemaker from Seaford, Sussex, who settled in Brighton around 1839. 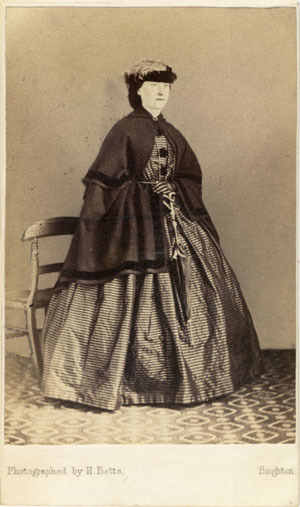 Matilda Ann Combs was born in Seaford in 1823. On 25th July 1842, in the Sussex parish of Hove, Matilda Ann Combs married George Boxell, a tailor. George and Matilda Boxell produced 5 children between 1843 and 1850 - Matilda (born 1843, Brighton), George (born 1844,Brighton), Thomas (born 1844,Brighton), Susan Elizabeth (born 1848, Tunbridge Wells) and Emma Jane Boxell (born 1849, Tunbridge Wells). When the 1851 census was taken, twenty-seven year old Matilda Boxell and her five children were inmates of the Brighton Workhouse. Mrs Matilda Boxell is described on the census return as "the wife of a tailor" and she and her children are all recorded as "paupers". 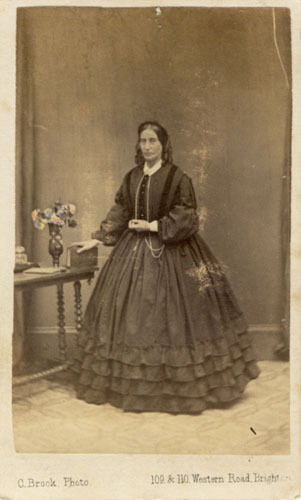 Matilda Combs, Thomas Boxell's mother, had five brothers and three of these siblings went on to become professional photographers in Brighton. Charles Combs (born 1830, Seaford) and John Combs (born 1834, Seaford) had opened a daguerreotype portrait studio in Brighton in 1854. Charles and John Combs, who preferred to trade under the name of Combes rather than Combs, ended their business partnership "by mutual consent" in May 1858. 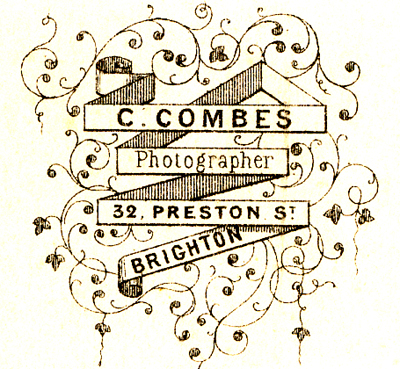 Charles Combes (Combs) operated a photographic studio on the Esplanade leading to Brighton's Chain Pier and by 1862, he had opened a second studio at 19 Bedford Place, Brighton. For a short time, Charles's brother John Combes, managed a photographic studio at 62 St James' Street, Brighton, but although he worked as a photographer for nearly 50 years, he did not have the same commercial success as his older brother. Matilda's youngest brother Benjamin Combs (born 1842, Brighton), also became a professional photographer and for ten years ran his own photographic portrait studio in Bishops Stortford. Benjamin Combs eventually returned to Brighton, where he worked as a beach photographer in he 1880s and 1890s. [ABOVE] The Brighton Workhouse in Church Hill, which was completed in 1822 and was in use until 1853, when it was replaced by the Elm Grove Workhouse. In 1851, four year old Thomas Boxell was an inmate of the Brighton workhouse along with his four siblings and his mother Mrs Matilda Boxell. [ABOVE] The trade plate of Charles Combes, Photographer of 32 Preston Street, Brighton (c1866). Charles Combs (1830-1872) was Thomas Boxell's uncle and possibly taught his young nephew photography in the 1860s. Thomas Boxell was first recorded as a proprietor of a photographic studio in Brighton in 1867. 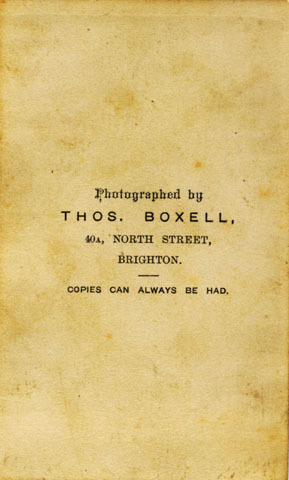 J. Harrod & Co.'s Postal & Commercial Directory of Brighton published in 1867 names T. Boxell as a photographer in North Street, Brighton in its list of professional photographers. Thomas Boxell appears in a list of 34 studio proprietors registered in Brighton by Harrod & Co. 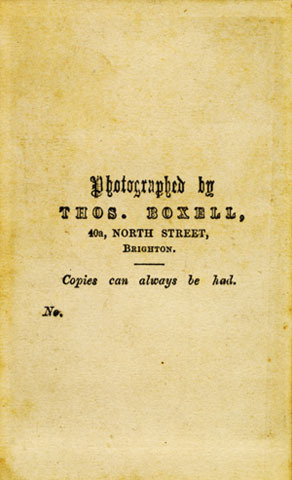 The following year, Page's 1868 Directory of Brighton included Thomas Boxell of 40 North Street, Brighton in its list of 'Photographic and Talbotype Artists'. The photographic portrait studio at 40 North Street, Brighton was previously occupied by photographer Frederick Joseph Taylor (born c1837, Marylebone, Middlesex). Frederick Taylor shared the business premises at 40 North Street with his wife Mary Ann Taylor, a milliner, and George Stephens, a brush manufacturer. The building was divided up between the three occupants - photographer Frederick Taylor gave his studio address as "40 1/2 North Street", while Stephens the brush maker was listed at "40A North Street". 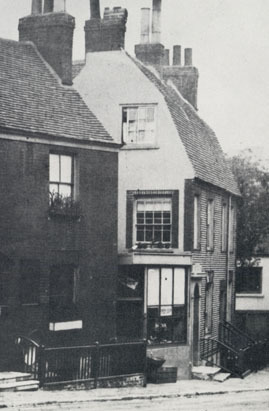 The building at 40 North Street, Brighton had been used as a photographic portrait studio since at least 1859, when Samuel Cox converted the upper floor of his tobacconists shop into a photographer's studio. The carte-de-visite portraits which were produced at 40A North Street, Brighton between 1867 and 1869 carry the printed legend "Photographed by Thos. Boxell". Around 1868, Thomas Boxell acquired a second studio at 11 Lewes Road, Brighton. 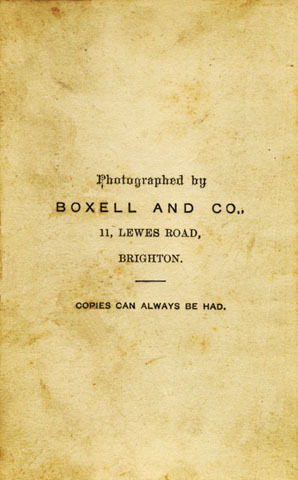 A Brighton trade directory published in 1869 lists Thomas Boxell as a photographer at both 40 North Street, Brighton and at 11 Lewes Road, Brighton. By 1870, Thomas Boxell had disposed of both photographic studios. In 1870, the studio at 40A North Street, Brighton was in the hands of J. T. Cox, possibly a relative of the original owner Samuel Cox and the studio at 11 Lewes Road, Brighton was being operated by Angelo Tagliabue (c1837-1900), an Italian from Milan. 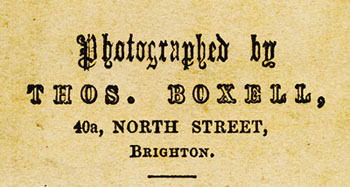 [ABOVE] Thomas Boxell listed as a photographer in North Street, Brighton in J. Harrod & Co.'s Postal & Commercial Directory of Brighton (1867). [ABOVE] A portrait of an unknown man seated at an occasional table,, photographed by Thomas Boxell of 40a North Street, Brighton (c1868). [ABOVE] A portrait of an unknown woman standing by a padded chair, photographed by Thomas Boxell of 40A North Street, Brighton (c1867). [ABOVE] A portrait of a married couple, photographed at the studio of Thomas Boxell & Co. of 11 Lewes Road, Brighton (c1869). [ABOVE] The reverse of the above carte-de-visite portrait showing the trade plate of Thomas Boxell, 40a North Street, Brighton (c1868). [ABOVE] The reverse of the above carte-de-visite portrait showing the trade plate of Thomas Boxell, 40A North Street, Brighton (c1867). [ABOVE] The reverse of the above carte-de-visite portrait showing the trade plate of Boxell & Co., 11 Lewes Road, Brighton (c1869). In 1868, Thomas Boxell married Ann Drake (born 1848, Ailsworth, Northamptonshire) in her native parish of Ailsworth, then within the county of Northamptonshire and now part of Cambridgeshire. Thomas Boxell's bride, Ann Drake, was the twenty-year old daughter of Mary and Robert Drake. Ann was born in Ailsworth, but was baptised in nearby Castor on 16th July 1848. Ailsworth and the neighbouring village of Castor came under the administration of Peterborough, four miles to the east. The marriage of Thomas Boxell and Ann Drake was registered in the district of Peterborough during the 2nd Quarter of 1868. It appears that Thomas Boxell had disposed of his Brighton studio around the time of his marriage to Ann Drake. After their marriage, the couple travelled to Maldon in Essex, where Thomas Boxell probably worked as a photographer for a year or so. Thomas and Ann Boxell's first two children were born in Maldon, Essex. Their first child, Minnie Boxell was born in Maldon, Essex, during the 2nd Quarter of 1869. A second child, a son named Harry Boxell, was born in Maldon during the 3rd Quarter of 1870. When the census was taken on 2nd April 1871, Thomas Boxell, his wife Ann and their two young children, one year old Minnie and nine month old baby Harry, were residing at 7 Grove Street, Halifax in the West Riding of Yorkshire. Thomas Boxell is described on the 1871 census return as a twenty-four year old "Photographic Assistant", so presumably he was employed by a studio proprietor in Halifax. Thomas Boxell remained in Halifax for another twelve months, during which time his young son Harry died (Harry's death was registered in Halifax during the 2nd Quarter of 1871) and his wife gave birth to a second daughter, Edith Mary Boxell, who was born in Halifax during the 3rd Quarter of 1871. Between 1872 and 1879, Thomas Boxell and his family travelled around Yorkshire, spending time in Driffield, Bridlington, and Pickering. During this time there were five more additions to the Boxell family - Maud Boxell (born 1873, Driffield), Eva Elizabeth Boxell (born 1874, Bridlington), Harold Tom Boxell (born 1876, Pickering), Augustus George Boxell (born 1877, Pickering) and Alice Boxell (born 1879, Pickering). Around 1880, Thomas Boxell and his large family arrived in the North Yorkshire seaside town of Scarborough. When the 1881 census was taken Thomas Boxell, his wife Ann and their eight children were residing in a house in Highfield in the Falsgrave district of Scarborough. Thomas Boxell was described on the census return as a "Photographer", aged 34. The latest addition to the Boxell family was Matilda Ann Boxell, who is recorded on the return as a five month old baby. Thomas Boxell decided to settle in Scarborough and a total of five children were born during his long stay in the Yorkshire holiday resort. Matilda Ann Boxell had been born in Scarborough during the 4th Quarter of 1880. Four more children followed, but of these only two survived infancy - Ellen Dorothy Boxell (born 1882), Emily Boxell (born early in 1884, but died before her first birthday), Frederick William Boxell (born 1885) and Albert Edward Boxell (born during the 2nd Quarter of 1887, but died during the Summer of the same year). By 1890, Thomas Boxell was running a photographic studio at 44 Victoria Road, Scarborough. Bulmer's 1890 trade directory of Scarborough lists Thomas Boxell as a photographer at 44 Victoria Road, Scarborough and gives his home address as 33 Victoria Road, Scarborough. When the 1901 census was taken Thomas Boxell was residing in Scarborough with his wife Ann and children. Thomas Boxell was described on the census return as a "Photographer", aged 54. All three of Thomas Boxell's grown-up sons - Harold Boxell, aged 25, Augustus Boxell, aged 23, and fifteen year old Frederick Boxell - were working as photographers, probably in the firm of Boxell & Co. 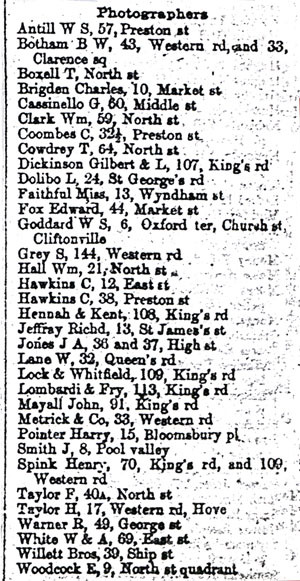 In Kelly's Directory of the North and East Ridings of Yorkshire, published in1913, Thomas Boxell & Co. are listed as photographers at 44 Victoria Road, Scarborough. Thomas Boxell's wife Ann passed away in Scarborough in 1914, at the age of 66. Thomas Boxell died in the North Riding of Yorkshire during the 1st Quarter of 1939 at the advanced age of 92. 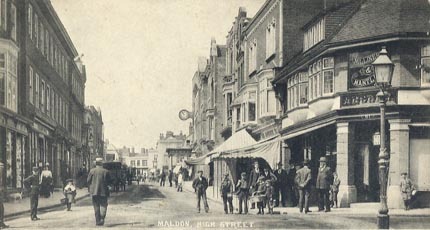 [ABOVE] A picture postcard view of Maldon High Street early in the twentieth century. Between 1869 and 1870, Thomas Boxell and his family were residing in the Essex town of Maldon. Thomas and Ann Boxell's first two children were born in Maldon, Essex. By 1871, Thomas Boxell and his family had left Maldon and were living in Halifax, Yorkshire. [ABOVE] The trade plate of Thomas Boxell of Scarborough Boxell taken from a carte-de-visite portrait produced around 1890. 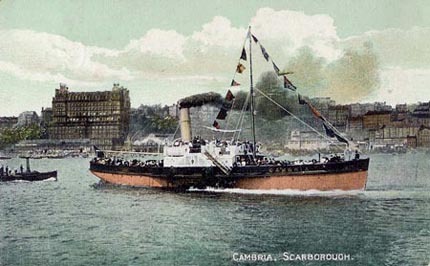 [ABOVE] A picture postcard published by Thomas Boxell & Co. of Scarborough showing the paddle steamer "Cambria" with the seaside resort of Scarborough in the background (1907). [ABOVE] A view of the seafront at Scarborough, North Yorkshire (1913). 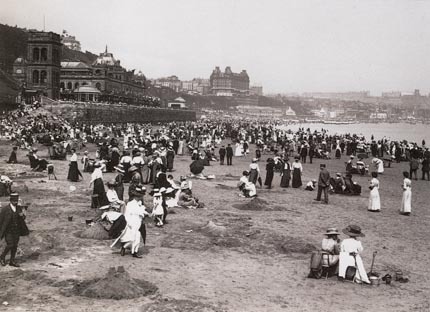 Thomas Boxell worked as a photographer in the seaside resort of Scarborough for over thirty years. Charles Thomas Brigden was born in Brighton in 1847, the son of Maria Staples and George Brigden, a tailor, who, at the time of Charles's birth, had a tailoring business at 31 East Street, Brighton. Charles Brigden, the fifth of eleven children born to Maria and George Brigden, was baptised at St Nicholas' Church, Brighton, on 8th August 1847. George Brigden, Charles's father, was originally from Cuckfield, a market town in the middle of Sussex. George Brigden, who was born in Cuckfield, Sussex, around 1813, married Maria Staples in Itchingfield, Sussex, on 24th April 1838. The couple's first child, Emma Brigden, was born in Cuckfield early in 1839, but Maria and George Brigden were residing in Brighton by the time their baby daughter was baptised at the Chapel Royal on 3rd July 1839. Ten children were to follow, all born in Brighton - Eliza (born 1841), Caroline (born 1843), George (born 1845), Charles Thomas (born 1847), William (born 1849), Maria Jemima (born 1851), Lewis (born 1853), Frank (born 1857), Wallace (born 1859) and Harry Brigden (born 1861). 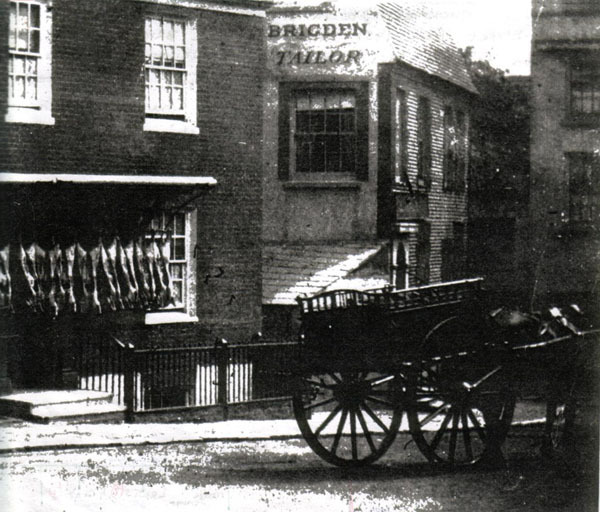 George Brigden established a tailoring business at 31 East Street, Brighton, around 1840. By 1850, George Brigden had moved to Brighton's Market Street. The 1851 census records George Brigden, his wife Maria, and their six children at 10 Market Street, Brighton. On the census return, George Brigden is described as a thirty-eight year old "Master Tailor". George Brigden lived and worked in Market Street for the next thirty years. As a young man Charles Thomas Brigden apparently showed some artistic talent and when the 1871 census was taken, the twenty-three year old gave his profession as "Artist". A few years earlier in 1868, when he had just turned 21, Charles Brigden set himself up as a photographic artist at his father's business premises in Market Street. The 1868 edition of Page's Directory of Brighton, lists Charles Brigden as a Photographic Artist at 10 Market Street, Brighton. Charles Brigden worked as a professional photographer from 10 Market Street, Brighton between 1867 and 1871. When the 1872 edition of Page's Directory of Brighton was published, Charles Brigden was listed as a photographer at 12 Market Street, Brighton. The change of business address probably resulted from the re-numbering of houses in Market Street rather than a move to a neighbouring building. 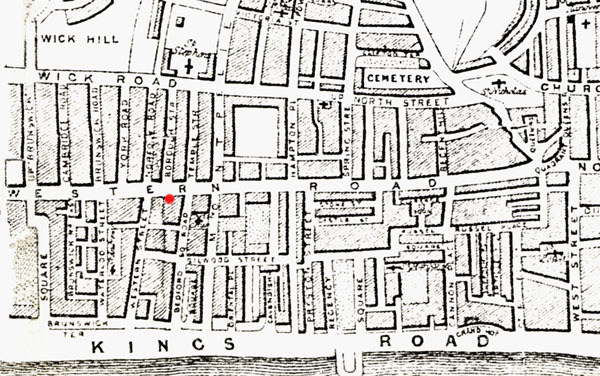 [ABOVE] A detail of a Victorian map of Brighton showing the location of George Brigden's tailoring business in Market Street (marked in red). George Brigden's son Charles Thomas Brigden (born 1847, Brighton) worked as a photographer from his father's house in Market Street for about five years. Market Street stretched from King's Road on the seafront to the northern end of East Street where the street branched out into two forks. Brigden's premises faced the rear entrance of the Sussex Hotel in East Street. 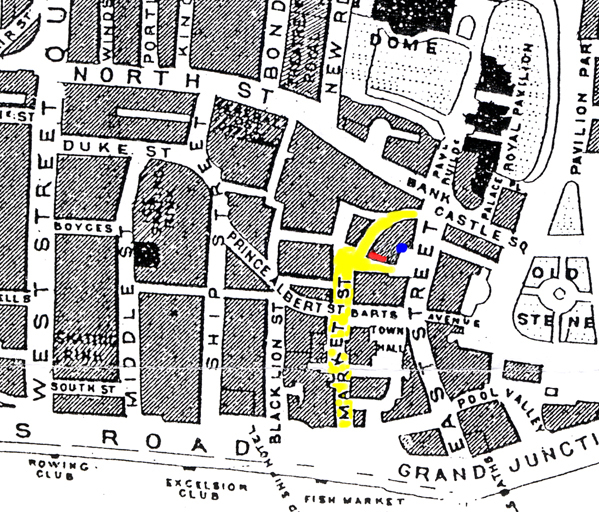 (The site of the Sussex Hotel is marked by a blue dot). [ABOVE] A photograph taken in the mid 1860s showing George Brigden's tailoring business at 10 Market Street, Brighton. 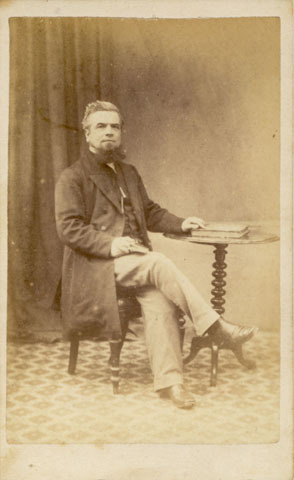 George Brigden's son Charles Thomas Brigden (born 1847, Brighton) worked as a photographer from his father's house in Market Street for about five years between 1866 and 1872. The rear of the Sussex Hotel can be glimpsed on the right. Animal carcasses hang outside Richard Tuppen's butcher's shop at No. 9 Market Street. Between 1867 and 1871, local trade directories give Charles Brigden's studio address as 10 Market Street, Brighton, but in 1872, he is listed as a photographer at 12 Market Street, Brighton. The buildings in this section of Market Street were re-numbered around 1871, with No.10 becoming No.12. [ABOVE] Charles Brigden listed as a photographer at 10 Market Street, Brighton, in J. Harrod & Co.'s Postal & Commercial Directory of Brighton (1867). [ABOVE] A photograph taken around 1878 showing the row of houses in Market Street behind East Street. On the left is Frederick William Witherden & Son's ironmongers shop at 11 Market Street, Brighton. George Brigden's tailoring business at No. 12 Market Street was located in the light-coloured building facing the Sussex Hotel on the right. In the 1860s Brigden's premises was numbered 10, and the building on the left was No.9. [ABOVE] The buildings at 11 & 12 Market Street, Brighton. The light-coloured building on the right (No.10 in 1867, No. 12 in 1872) was used by George Brigden's tailoring business between 1840 and 1880. Charles Henry Brook was born in Brighton around 1825, the son of Philadelphia and Richard Brook, a tailor of 6 Western Street, Brighton. Richard Brook had married Philadelphia Manctelow (born c1791, Rotherfield, Sussex) in Burwash, Sussex, on 3rd April 1811. The couple began their married life in Burwash and two of their children Alfred Brook (born c1820) and Caroline Brook (born c1823) were born in this Sussex village. Sometime around 1824, Richard and Philadelphia Brook and their young children moved to Brighton, where Charles Brook was born about 1825. Charles Brook's two younger sisters, Frances Brook (born c1829) and Ellen Brook (born c1835) were both born in Brighton. In 1848 or 1849, Richard Brook died and his tailoring business passed to his widow Mrs Philadelphia Brook (c1791-1857). When the 1851 census was taken, the household at 6 Western Street, Brighton comprised of Mrs Philadelphia Brook, a sixty year old widow who gave her occupation as "Tailor", her three daughters, Caroline, Frances and Ellen, and her two sons, Alfred Brook, a thirty-one year old "Tailor" and Charles Brook, who is described by the census enumerator as a "Tailor & Parish Clerk", aged 25. By 1854, the Brook family had taken over premises at 109-110 Western Road, Brighton. Mrs Philadelphia Brook and her eldest son Alfred Brook (born c1820, Burwash) ran their tailoring business from 110 Western Road and Charles Brook operated a stationery and bookselling business next door at 109 Western Road, Brighton. By 1857, Charles Brook had expanded his business and taken over the adjoining building which had housed his brother's tailors shop. ( Alfred Brook had moved his tailoring business to 9 Temple Street, Brighton ). An 1857 Brighton trade directory lists Charles Brook as a "Bookseller, Stationer & Bookbinder" at 109 & 110 Western Road, Brighton. On 26th November 1860, Charles Brook married Mary Maria Hemsley (born c1831, St Pancras, London) at St Nicholas' Church, Brighton. For the next three years, Charles and Mary Brook ran the bookselling and stationery business at 110 Western Road, Brighton. Around 1861, Charles Brook opened a photographic portrait studio at his business premises. For a few years, photographic likenesses were taken at Charles Brook's shop at 109 & 110 Western Road, Brighton. Charles Brook was not listed as a photographer in Western Road in local trade directories between 1861 and 1863, yet surviving carte-de-visite portraits provide evidence that Charles Brook was the proprietor of a a photographic portrait studio at 109 & 110 Western Road, Brighton. In 1863, Charles Brook's business in Western Road went bust. A trade journal of 1863 reported "In addition to the long list of names in the Gazette, we regret to say that Mr. ASHENDEN, of Canterbury, Mr. Charles BROOK, of Brighton, Mr. GUNN, South Bridge, Edinburgh, and Mr. John HADDEN, College, Glasgow, have been unable to meet their engagements, and have summoned meetings of their creditors". Charles Brook's studio at 109 Western Road, Brighton was sold to The West End Photographic Company. By 1865, the studio had passed to Henry Spink who remained in control of the photographic studio at 109 Western Road until his death in 1892. After the collapse of his bookselling business, Charles Brook and his wife Mary moved to South Weald in Essex. When the 1871 census was taken, Charles Brook was running a school with his wife at Arnold House, Warley Road, South Weald. On the census return, forty-five year old Charles Brook is described as a "Schoolmaster", and his wife Mrs Mary Brook the "Schoolmistress". The school venture was a more successful enterprise than his bookselling business. Ten years later, when the next census was taken on 3rd April 1881, Charles Brook was still in charge of the school in Warley Road. Kelly's 1894 Directory of Essex lists Charles Brook as the proprietor of the private school at Arnold House, South Weald, Brentwood, Essex. 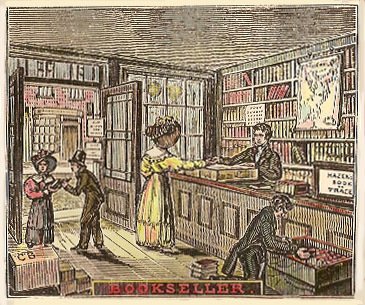 [ABOVE] A woodblock engraving showing the interior of a 19th century bookshop. Between 1854 and 1863, Charles Brook ran a bookselling and stationery business at 109 Western Road, Brighton. [ABOVE] A portrait of an unknown woman standing by a writing desk, photographed at the photographic studio of Charles Brook, Bookseller of 109 & 110 Western Road, Brighton (c1862). [ABOVE] "C. Brook. Photo.109 & 110 Western Road, Brighton" - the credit printed on carte-de-visite portaits produced at the photographic studio located in Charles Brook's bookselling business in Western Road (c1862). [ABOVE] A detail from an 1865 map of Brighton showing the location of Charles Brook's bookselling business at 109 & 110 Western Road, Brighton. [ABOVE] A full-length portrait of an unknown woman holding a book, photographed at the photographic studio of Charles Brook, Bookseller of 109 & 110 Western Road, Brighton (c1862). 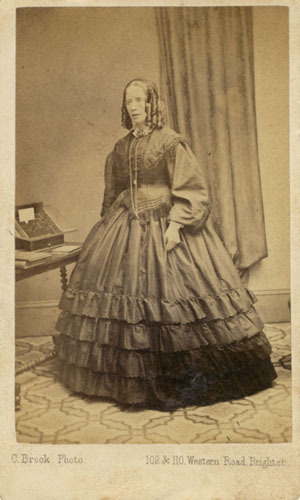 Arthur Brookes was a London photographer who operated a photographic portrait studio in Brighton for a couple of years between 1860 and 1861. Arthur Edward Brookes was born in London, Middlesex, around 1825. During the 1st Quarter of 1851, Arthur Edward Brookes married Henrietta Carroll (born c1829, London), the daughter of Margaret Carroll (born c1812, Ireland), a military cape maker. This union produced at least 5 children - Edward Arthur Brookes (born 1852, St Pancras, London), William Brookes (born c1854, London), Henrietta Rachel Brookes (born 1855, St Pancras, London) Charles Brookes (born c1858, London) and Arthur Michael Brookes (born 1860, Clerkenwell London). 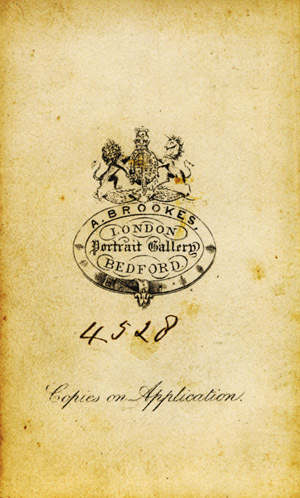 Around 1853, Arthur Brookes established a photographic portrait studio at 711/2 Oxford Street, London. After a year or so, Arthur Brookes moved to a new studio at 12 Bath Place, New Road, St Pancras, London, where he remained until 1855. The following year Arthur Brookes set up a new photographic studio in London's Oxford Street. From 1856 to 1858, Arthur Brookes was based at 312 Oxford Street, but around 1859 he relocated to 199 Oxford Street, London. 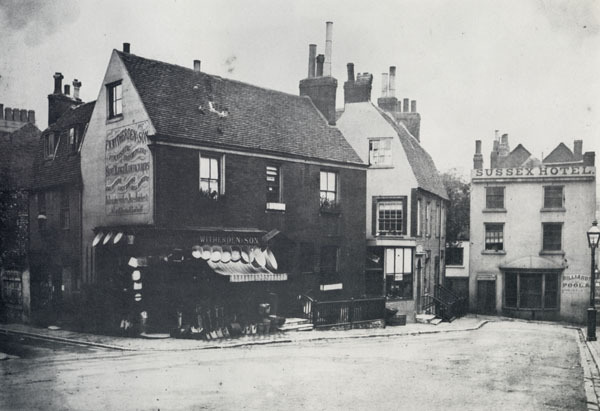 Early in 1860, Arthur Brookes moved down to Brighton where he acquired a photographic portrait studio at 27 St James Street, Brighton, a studio formerly jointly owned by photographer Francis Ross Wells (1834-1893) and William Henry Hilton (c1831-1920), a photographic instrument maker. Arthur Brookes worked from the studio at 27 St James Street, Brighton, for less than a year when he got into financial difficulties. On 12th December 1860, George Robert Goodman, a solicitor acting on behalf of Arthur Brookes, published an Insolvent Debtor's Notice in the Brighton Guardian. Mr Goodman announced that "Arthur Brookes, formerly of 13, Bath place, New road, then of 199 Oxford Street ...now of 27 St James's street, Brighton, in the county of Sussex, photographic Artist, an Insolvent Debtor" was set to appear in the County Court of Sussex on "the 22nd day of December 1860, at Ten o'clock in the forenoon precisely, for his first examination, touching his debts, estate, and effects." Arthur Brookes, described as a "photographic artist" of 27 St James Street, Brighton, duly appeared at the County Court, supported by his attorney, Mr G. R. Goodman of Ship Street, on the morning of 22nd December 1860. Four days later, on 26th December, the Brighton Guardian, published a report of the hearing. Arthur Brooks' debts totalled nearly 70 pounds (sterling) and no money was owed to him. Representing Arthur Brookes, solicitor George Goodman alleged that Mr Barkley (a creditor opposing the photographer's petition for insolvency) "had been round threatening insolvent and his wife that if he didn't agree to certain conditions or give up certain articles he would oppose." 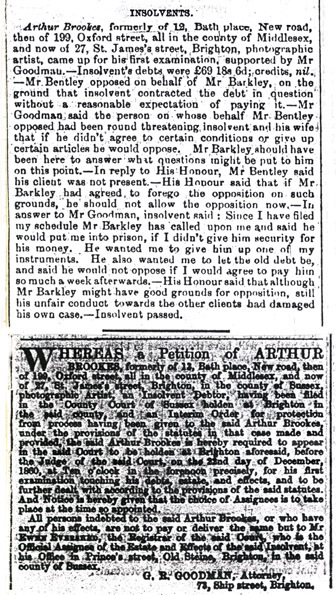 Giving evidence to the Court, Arthur Brookes maintained that Mr Barkley had "called upon me and said he would put me into prison, if I didn't give him security for his money. He wanted me to give up one of my instruments (cameras). He (Mr Barkley) also wanted me to let the old debt be, and said he would not oppose if I would agree to pay him so much a week afterwards." The Court criticised Mr Barkley's "unfair conduct" and passed Brookes' petition for insolvency. Some three months after Arthur Brookes was declared insolvent, he was still residing in Brighton and working as a photographer. The census carried out on 7th April 1861, records Arthur Brookes, his wife Henrietta, and their three children, at 7 Spa Street, Brighton. Arthur Brookes is described on the 1861 census return as a thirty-six year old "Photographic Artist". Arthur Brookes' three children - Edward, aged 9, William, aged 7, and five year old Henrietta, were all attending school in Brighton at the time of the census. Arthur Brookes disappeared from Brighton around 1862. A photographer identified as A. Brookes of the London Portrait Gallery, Bedford, was active in Bedfordshire in the mid 1860s (see illustrations below). Arthur Brookes was probably back in London by 1868. Arthur's wife Henrietta Brookes died in the parish of St Martin in the Fields during the 2nd Quarter of 1868, at the age of 39. Arthur Brookes re-married within a year of his first wife's death. Arthur Brookes married Ann Hannah Foster (born c1842 Southwark) in the Strand district of London during the 2nd Quarter of 1869. A photographer named Arthur Brookes is recorded at a studio in East London between 1877 and 1881. London trade directories list Arthur Brookes as a photographer at 369 Kingsland Road, London, between 1878 and 1883. The 1881 census records Arthur Brookes at 369 Kingsland Road, London, but his age is wrongly entered on the return as 43. Living with Arthur Brooks at 369 Kingsland Road is his second wife Hannah Brookes, their four children and a daughter from his first marriage (Henrietta) Rachel Brookes, described on the census return as a "Professional Dancer". It appears that Arthur Brookes died not long after the 1881 census was taken. Arthur's widow Mrs Ann Hannah Brookes took over her late husband's studio, operating the business under her husband's name until around 1882. Mrs Brookes opened a photographic studio under her own name in 1883. Mrs Ann Hannah Brookes is listed as a photographer in Stoke Newington Road, Hackney between 1883 and 1887. Mrs Brookes returned to Kingsland Road, Hackney in 1887 but after a year or so, she moved to Finsbury. Between 1889 and 1899, Mrs (Ann) Hannah Brookes is recorded as the proprietor of a photographic studio at 261 Goswell Road, Finsbury. When the 1891 census was taken at 261 Goswell Road, forty-nine year old Mrs Hannah Brookes described herself as a "Photographeress". Mrs Ann Hannah Brookes died in Islington in 1915 at the age of 74. Arthur Brookes' eldest son Edward Arthur Brookes (born 1852, St Pancras, London) later worked as a photographer in East London. Between 1890 and 1891, Edward Arthur Brookes was running a photographic studio at 432 Seven Sisters Road, Hackney. By 1901, Edward Brookes was working as a photographer in West Ham. Edward Arthur Brookes died in West Ham in 1914 at the age of 62. Another son, Arthur Michael Brookes (born 1860, Clerkenwell London) also worked as a professional photographer. At the time of the 1891 census, Arthur Brookes junior, described on the return as a thirty year old "Photographer", is recorded at 74 Redcross Street, Southwark, London with his 5 year old son Walter. Interestingly, Arthur Brookes junior, who was a baby when he arrived in Brighton from London with his parents in 1860, informed the census enumerator that he was born in Brighton. [ABOVE] Two accounts of the insolvency case concerning the Brighton photographer Arthur Brookes of 27 St James' Street, Brighton. [TOP] An account of the examination of Arthur Brookes, an insolvent debtor, at the County Court on 22nd December 1860, as reported in the Brighton Guardian on 26th December, 1860. [BOTTOM] A notice placed in the Brighton Guardian on 26th December, 1860, announcing Arthur Brookes' appearance at the County Court as an "Insolvent Debtor". 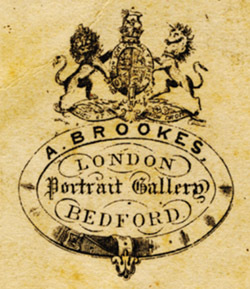 [ABOVE] The trade plate of A. Brookes, photographer at the London Portrait Gallery, Bedford, taken from the reverse of a carte-de-visite portrait produced around 1867.